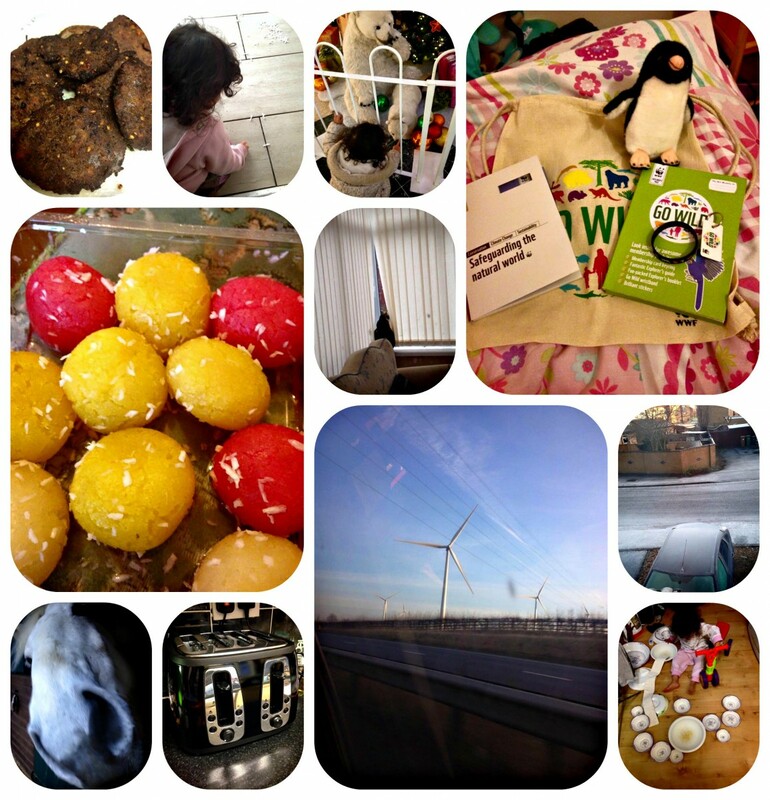 Project 365 – Final days! Wooo can’t believe I’ve managed to complete another year of photos! Well done to everyone who has! I haven’t decided yet if next year will do a Project 52 instead…..
Day 355 – Still feeling really rough but luckily the hubby was home so he did some cooking and made these kebabs. They actually tasted really nice. Day 356 – Off to the docs this morning has had this cold for a while and got some antibiotics as I keep getting a fever too. The builder returned today to start tiling the conservatory floor and of course Bee had to help. Day 357 – Went shopping at 7pm hoping it would be slightly quieter but it was still manic! Bee loved the Christmas decorations and promptly tried to grab the polar bear. Day 358 – Munchkin had wanted to adopt a penguin and join the WWF club. Her package arrived today. Day 359 – Christmas Day. We don’t usually do anything special….hubby went out and got these sweets. Day 360 – Rosie has taken to shoving the blinds of the conservatory to one side and looking out the window! Day 361 – Munchkin’s riding lesson today. We missed it last week as I had no energy to go out in the cold. This horse is such a greedy thing..shoved me with his nose to try to get my hot chocolate! Day 362 – I didn’t go to the sales but did online shopping. My toaster arrived – yes I got excited at a toaster! Day 363 – Went to Birmingham today to to the Pakistan embassy – saw loads of these wind turbines on the way. Day 364 – Lots of ice this morning…. so stayed at home as although Bee and myself are feeling better our coughs haven’t gone…..and I started painting the conservatory. Day 365 – Bee…..in the kitchen…with the dishes….need I say more! That is a beautiful toaster! How nice of the builder to let Bee help ( or was that hinder). I love the look of wind turbines think they are therapeutic to watch go round ( yes I know Im daft!!) . Its nice to adopt animals, every little helps them. Happy New Year to you and yours and hope you are joining in to some extent this year as well. Choosing a toaster’s a very important thing, and it looks exciting. Think that’s a sign of being a parent! I got to admit I love them too.. I love photos so I can never get enough of seeing the world through the eyes of others.